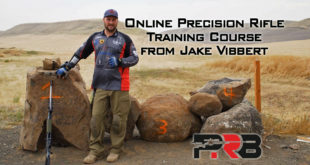 This is one of the last posts covering the detailed data collected over the past 4 months for an epic scope field test focused on long-range, tactical rifle scopes in the $1,500+ price range. This represents an unprecedented, data-driven approach to evaluating the best tactical rifle scopes money can buy. Hundreds of hours have gone into this research, and both the scope line-up and the tests I conducted are built on advice and feedback from some of the most respected experts in the industry. My goal with this project was to equip fellow long-range shooters with as much hard data as I could reasonably gather, so they could see what they’re paying for. I’ve already touched on optical performance, ergonomics, reticles, advanced features, and warranties. This post looks at mechanical performance, including how precisely calibrated the adjustment clicks were, internal adjustment range, travel per revolution, and other aspects. I surveyed over 700 shooters, and mechanical performance was rated as the most important feature of a scope. In fact, mechanical performance received 30% more votes than optical performance. A scope that doesn’t track, or have repeatable adjustments seems to be viewed as the biggest flaw a scope could have. “Yearly, a virtual mountain of written information is spewed forth from the word processor of gun writers. 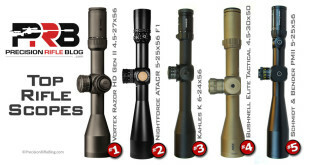 … When the subject is “riflescopes,” the writer’s primary focus is on external looks, dimensions, weight, reticle, image resolution, power range, and similar physical characteristics. 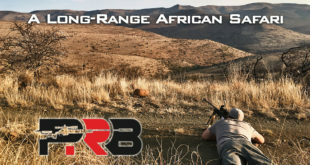 It is impossible to find an article that evaluates a particular riflescope or runs a test on a group of a riflescope’s ability to accurately respond to elevation and windage knob adjustments. Well, Dennis you got your wish! I talked to Dennis a few months ago as I was planning this test. He has a ton of experience in testing the mechanical precision of riflescopes, and was a wealth of knowledge. In fact, Dennis created an entire line of calibration targets, which are designed to be a simple, inexpensive way to reveal any flaws in a scope’s mechanics (more on those later). He was very excited to hear someone was thinking about performing a serious evaluation of mechanical performance, especially when it involves such a large sampling of the best scopes available. It is surprising how little has been written on this topic, and I originally thought that could be because they all perform so well that there wasn’t a lot to differentiate between or talk about … wrong. I found a surprising amount of variance among the 18 scopes tested, so let’s dive into the results. Did you catch that? Bryan said more often than not, scopes have some amount of error in them. This test was designed to quantify that error, and I feel like it did that extremely well. It produced a clean set of data that was completely repeatable. In my continued tradition of 100% transparency on where this data came from, first let me explain how I performed the tests. At a measured distance of 100 yards, set up a 4 foot tall target with the aim point near the bottom. Using a level, draw a vertical line extending from the aim point to the top of the target. Fire a 5 shot group at the aim point with your 100 yard zero. Adjust the scope up 10 MOA and fire another 5 shot group. Adjust the scope up 10 more MOA and fire another 5 shot group. Adjust the scope up 10 more MOA and fire another 5 shot group. At this point, you should be hitting 30 MOA above your aim point. Measure the distance between the centers of the groups and see if they’re truly 10 MOA apart (should be 10.47” at 100 yards). This approach is an outstanding test, and what most shooters to do. However, since this is an extreme field test, I changed a few aspects to ensure that the data collected was as complete and accurate as possible. First, I removed the inherent dispersion of the rifle, ammo, and shooter from the equation. Although, I have custom rifles capable of averaging 0.3 MOA groups, even with that tiny spread the exact center of the group could still vary by a fraction of an inch in one direction or another from the precise spot the scope was pointing. Instead of mounting the scope on a rifle, I placed it in a Spuhr mount, and attached that to a custom fixed mount. This was essentially like putting it inside a vise, and it allowed me to manipulate the knobs up and down with the scope body held securely in a fixed position. There was no play in the mount, which was further confirmed by completely repeatable results, regardless of how many times I performed the test. The idea for this mount came from Tim K at Sniper’s Hide. I decided early on to use Spuhr mounts for all of the mechanical tests, because I believe they’re the most rock-solid mounts money can buy. I’ve used them on my personal rifles for a couple years, and they’ve proven themselves in the field. Although Spuhr mounts are expensive (typically around $400), I wanted to go to extreme lengths to know with certainty that any point of aim shift recorded was NOT due to movement within the mount. Spuhr mounts provide that confidence. Spuhr mounts have a couple features that were especially helpful for these tests. First, they’re a one-piece mount that are precisely machined from a single billet of aluminum, which means there is no need to lap the rings. The rings are perfectly aligned, which ensures more surface contact with the scope tube and also prevents stress on the scope tube, which can dent the tube, distort the reticle, and cause adjustment problems. Spuhr mounts also feature a bubble level built into the rear of the mount, which I used to ensure the mount was completely level during the tests. Although Spuhr offers 29 different models of one-piece picatinny mounts, there were a few scopes with irregular dimensions that wouldn’t work in a standard size mount. The Valdada IOR RECON Tactical 4-28×50 has a proprietary 40mm tube, so I used the rings made by American Rifle Company Valdada included to mount that scope. The US Optics ER25 5-25×58 has an unusually long turret box, and it wouldn’t work in any the 6 Spuhr mounts I had. So I used the US Optics rings they provided to mount that scope. While these other rings may not have all the bells and whistles of the Spuhr one-piece mounts, they seemed very solid and the manufacturers obviously believe in them (because it’s what they sent me for testing). Instead of a 4 foot target with a hand drawn line, I used Horus Calibration and Training System (CATS) Targets, which were designed for testing optical equipment just like this. For this test, I used their 0280F MIL/TMOA Series targets, which are enormous at 8 foot tall by 3 foot wide. They feature a 25 mil ladder (and an 83 MOA ladder) in the vertical direction. This target was specifically designed to validate the accuracy and repeatability of the numerical values and the click adjustment on a scope’s elevation knob. It also provides an extremely accurate method to check cant. Horus has their CATS targets printed by a drafting company, instead of a typical printing company. Although drafting companies are much more expensive, they have intense tolerances to ensure the scales are ridiculously precise. The enormous CATS target allowed me to more than double the elevation range tested. Since all of these high-end scopes are designed for long-range, I didn’t want to just test up to 30 MOA. Instead, I tested in 5 mil increments up to 20 mils (i.e. 5 mils, 10 mils, 15 mils, and 20 mils). I had similar increment sizes for the few MOA scopes I tested, with those going up to 70 MOA. 20 mils is 72” at 100 yards, and 70 MOA is 73.29” at 100 yards. And the Zeiss Victory scope actually had clicks that were 1/4 inch at 100 yards, which is more commonly referred to as Shooter’s MOA. I found a way to accurately calibrate that scope using this target as well. So the elevation adjustments tested were similar regardless of the units. Any error present in a scope’s adjustment is compounded with each turn of the turret, so I wanted to push these scopes to see what they’re capable of. The setup of this test is extremely important. First, the distance to the target has to be precisely 100.00 yards. To do that I used a Leica Disto E7400x Laser Distance Meter, which is accurate to ± 0.1 mm. That should do! This isn’t a typical rangefinder, because it only reads out to 400 feet. It is a precision instrument used in the construction industry, and it’s far more accurate than using a steel tape or survey chain that could deflect or follow the contour of the land. The question usually arises: Do I measure from the middle of the riflescope or from the muzzle to the target? Both are equally important as the rifle does the shooting and the scope provides calibration adjustment. To resolve this issue, establish an imaginary point located midway between the middle of the scope and the rifle muzzle. If you place your rifle at this shooting position, you have approximately ±10 inches to adjust your rifle to a comfortable position. Remember, there are 3600 inches in 100 yards; this 10 inch zone produces a +/- error of approximate 1/3 of 1% (= .0033). Since I wasn’t mounting on the scope on a rifle, I didn’t need the ± 10 inches of variance to adjust the rifle, so this should be even more accurate than what was explained above. I simply setup my fixed mount so the scope would be the correct distance behind that imaginary line. I used a common 24” barrel for calculating the exact distance. It is not only important to ensure the target is perpendicular with the shooter (see right angle in previous diagram), but the vertical ladders on the grid should also be precisely vertical as well (see right angle in the next diagram). That ensures if the scope is level, it should track straight up the line on the target. Once again, a very long level was used to set and double-check that the target was vertically plumb. I also “broke in” the scope knobs before I started any of these tests, by rotating each knob through its entire range 50 times! This ensures any quirks from new, stiff mechanics should be settled down. I’m not sure there would be any on these high-end scopes, but I definitely didn’t want to take a chance of it skewing the results. After the first 5 mil adjustment, I’d get back behind the scope and continue to turn the knob until the reticle was perfectly even with the 10 mil line on the target. Then I’d look up and record how many clicks it actually took to get it there. I’d repeat this for 3rd and 4th adjustments. This “no live fire” approach worked well because all of these scopes have extremely high magnifications. If you were testing a typical 3-9x hunting scope, this may not have worked. But the lowest power scope in my group was 18x, with most around 25x and some up to 30x. Even at 18x, you could still clearly see the Point of Aim (POA) with precise granularity. This seemed like a very clean approach to testing mechanical calibration, especially because each time I adjusted the scope to a point on the calibration target, I wouldn’t raise my head to check the knob until I was satisfied the crosshairs were perfectly aligned. This seemed like a very honest approach, and ensured I wasn’t inserting some kind of bias into the results. I ran through this test at least twice for every scope, and found my results were completely repeatable. This gives me a lot of confidence in the data. I can’t say how impressive that is. After I had tested several scopes from big-name brands, I started to doubt whether it was even possible for a scope to be 100% accurate all the way out to 20 mils. I was recording variances down to a ½ click, which was 0.05 mils on most scopes. So at the extreme adjustment of 20 mils, that means an error as small as 1/4 of 1% was identified (0.05 mils ÷ 20.0 mils = 0.0025). But, even with that absurd level of scrutiny, there were still 4 scopes that were flawless all the way through 20 mils of elevation adjustment. Wow. Most of the scopes had adjustments in mils/mrad, but a few were MOA, and the Zeiss Victory scope was actually in Shooter’s MOA. All were tested to approximately the same amount of overall travel and increments. Once again, you can see the Hensoldt, Kahles, US Optics, and Valdada all tested perfectly at 5, 10, 15, and 20 mils. But, you can see most of the scopes tested very well. The Leupold Mark 6 was only off by 1 click at 20 mils, and the Leupold Mark 8 was just 1/2 a click off at both 15 and 20 mils … which is very close to perfect. The Nightforce BEAST was off 1/2 click at 10 mils and 15 mils, and a full click at 20 mils. The Nightforce ATACR was dead on at 5 and 10 mils, but was off by 1 click at 15 mils and 1.5 at 20 mils. I asked Nightforce how much the erector tube actually moves inside the scope body with each click of the turret, and while they said the exact amount varies by model, it would be around .007 inches per click for these scopes. That means that with each click the erectors are moving the tube by the width of a single hair. Honestly, considering that each click is making those microscopic adjustments, most of the scopes performed impressively … although some were better than others. You might notice that the Leupold Mark 6, and Nightforce ATACR both have “2nd scope” by their label, and the March 3-24×42 scope has “Average of 2 scopes.” The first time I ran through the mechanical tests, those 3 test scopes showed more error than others in the test. I thought the results might be a result of a defective unit, so I contacted each manufacturer. First, I completely understand that it is impossible (and impractical) for every scope to be perfect, so I always want to give a manufacturer a chance to fix something like that before I publish results that may not be representative of the typical unit. At the same time, I’m committed to being completely transparent and honest with my readers. So if I run into something like this, I give the manufacturer a shot at fixing it, and then in the article I mention the issues I ran into and how it worked out in the end. That seems like the most respectful and fair approach for both the manufacturers and readers. However, the replacement March scope that Kelbly.com sent unfortunately didn’t follow that same pattern. In fact, while the 2nd March scope performed similar to the original, it was actually slightly worse overall. The original scope had an average of 2.2% of error in the elevation adjustment through 20 mils, and the replacement had an average of 2.7% of error. I really didn’t know exactly what to do with those results, because with similar results this didn’t seem to simply be due to a defective unit like the Leupold and Nightforce scopes. I decided the best approach was to simply average the results from both scopes and publish that as my results for the March scope. Here is another way to look at the same data. In this chart, I looked at what percent each scope was off at each of the 4 adjustments and then averaged those together. One note here is that the Zeiss Victory Diavari 6-24×56 didn’t have enough elevation travel to reach the 4th adjustment. It had less overall elevation travel than the other scopes, and only adjusted 58” at 100 yards. The 4th adjustment here was around 72” at 100 yards. I didn’t want to decrease the range I was testing all the other scopes at just because the Zeiss didn’t have enough travel to get to the last adjustment, so I averaged the 1st, 2nd, and 3rd adjustments for the Zeiss here and just wanted to note that. Does a 1% error matter? While 1% isn’t much, this might depend on who you ask. Let’s look at a practical example to wrap our head around what that means. If it takes exactly 10.0 mils of elevation adjustment to hit at 1,000 yards (ballistics similar to a 308 Win), what does a 1% error do to our point of impact? For this example, 1% error essentially means you’re off by 1 click, and 2% error would be 2 clicks off. If you were shooting at a relatively small 1 MOA target, being off 1% would still result in a hit … as long as you perfectly accounted for all other variables. It would be 1.5” from the edge of the target, so there isn’t much margin for error. At 2%, you’d be well off target. In this example, a 1.5% error would push you off the edge of the plate. Here is another example showing a 1.5% error for a 20 mil adjustment at a 1 mile target (ballistics similar to 338 Lapua Magnum). This example is shown with a larger 2 MOA target, since that’s more typical at that distance. You can see you’d be off plate at that distance, even on the larger target. Being off by 1.5% of 20 mils, is the same as being 3 clicks off (assuming 0.1 mil clicks). Even if the error isn’t enough to throw you off target, it still makes you question the accuracy of your ballistic solution. Error in scope adjustments is one of the most common reason someone’s firing solution doesn’t match up with their impacts in the field. Most shooters immediately start changing the inputs of their ballistics until it matches the number on the turret when they got a hit. They call it truing, but really, they’re adjusting the solution to better fit their erroneous turret. This can actually work … mostly. But it can also have unintended consequences, not the least of which is undermining your confidence in the computer-generated trajectory predictions. I want to make it clear that these results shouldn’t be taken as universal. I tested one or two scopes of each model, and while this may provide a rough, ballpark idea of the mechanical calibration you can expect from different brands … you shouldn’t assume every scope will match these results. Actually testing your scope using the tall target test is one of the first steps of any serious shooter. There is no substitute for knowing how your scope tracks. When you say “I…found my results were completely repeatable”, does that mean you found that the scopes movements were repeatable, but not calibrated correctly, or does that mean that they had a consistent amount of error from where they should have been, but not necessarily a repeatable amount of error? Great question, sorry I wasn’t more clear on that. I meant that I achieved identical results regardless of how many times I performed the test. If the scope was 0 clicks off at 5 & 10 mils, 1 click off at 15 mils and 2 clicks off at 20 mils … I could run that test several times on the same scope and it yield the exact same results every time. That’s all I meant. It just gives me confidence that there wasn’t inherent variability in the test method … any variance was from the internals of the scope. Hope that makes sense! I run the same March scope that has been tested here and recently had it evaluated by Charlie at Score High Gunsmithing. He does a similar test and came up with very similar results. The true click value of this model of March scope appears to be closer to 0.1034, rather than 0.01. To correct for this mil turret click value error, I simple enter a correction factor of 0.97 in the Shooter Ballistic Calculator App, and never think about it again. Wow, great feedback. I also found the reticle calibration to be perfect and the return to zero to be perfect. I plan to go over all that stuff in the next post. Another objective party finding the same results brings even more credibility to these findings. Another guy on Reddit mentioned he had an ATACR, and his tall target test matched my results as well. You can certainly account for this error in your ballistics if the engine allows it, and you know exactly what your correction factor is (ie you tested your own scope) … and it’s consistent through the entire adjustment range. The March and few others seem to be consistent in the percent of error, although a few others weren’t. Litz said some scopes might have a different correction factor for each revolution (which sounds like a pain). But if it’s consistent, and you’re careful … You can account for it and it shouldn’t have any bearing on results from that point on. Do you mean 0.0134 MIL vice 0.1034 MIL? I’m setting up to do the test this weekend time/weather permitting. I’m not sure, but I bet he meant his adjustments were 0.1034 mils per click instead of 0.1000 mils per click. Thanks for the clarification Christopher. I figured that’s what you meant. Just one more question. How did Charlie run his test to get this result? Was it exactly the same way as Cal? On the Score High Gunsmithing website (http://www.scorehighgunsmithing.com/) Charlie talks about the jig he made and the story behind it. It is basically the same test. I don’t want to hijack Cal here, if you have anymore questions email me, ctressler@gmail.com. Hello, I think not discriminate on the scope of SPF that are built in FFP. The riflescopes built in SFP has a tuning that do not look in the FFP. Think I should divide the groups and check with the manufacturer and the error rate that they will pass, it is in relation to your test. Excuse my English, I’m a shooter Argentina. Hey Hernado, I appreciate the comment and I hope I haven’t misunderstood what you’re saying, but I appreciate you trying to voice it. Your English is much better than my Spanish! And I think this error rate does pass each companies quality control … or it wouldn’t have left their factory. Vortex did say they would absolutely repair a scope that performed like this, but they also said to go ahead and publish the data because a customer could have received that scope. Hope this makes sense and addresses your question. Thanks again for the comments! I’ve been following your work with great interest but I personally do not think it appropriate to compare riflescope in FFP and SFP. The price difference is also very different, and 7,000 others are in the range of 2,300. I have a NF ATACR and I really feel very satisfied. I’m surprised the failure of the S & B PMII 3-27×56 and after owning a S & B MTC system, I can say that’s not a very good system because ah presented many drawbacks. Thanks for the comments, Hernando. I understand what you’re saying on FFP & SFP scopes, but the truth is many people see that as just one feature and they’re trying to strike the right balance between price, clarity, mechanical precision, zoom range, and a bunch of other characteristics (including FFP & SFP). I personally own FFP & SFP scopes and use both regularly, and while I prefer a FFP scope … I don’t prefer it at any cost. If there was a SFP scope that had vastly better resolution, contrast, tracked perfectly, had an ideal reticle, had 3-30x zoom, and was compact and lightweight … suddenly I might be willing to compromise on the focal plane. There are just a lot of factors that play into a scope, and while FFP vs SFP is one of the biggest … In the end it’s just one aspect, and shouldn’t be viewed in isolation from the rest. Thanks again for the comments. I’m glad you found this stuff helpful. I cannot begin to tell you how much I appreciate your work with this series! I absolutely love the approach that you have taken with this evaluation. Very nice work Sir! OK Cal, you have really got a debate started with my group and we have been arguing a lot about what is the MILRAD standard being used by each scope maker as there are so many versions/interpretations of what a mil should be represented as. If the scope maker uses the mathematical definition of 1/6283 then you will get a different result to a scope maker who uses the mathematical definition of 1/6400. Both are deemed to be correct and both give you near enough range measurements; noting of course there will be a slight difference between the two systems. 1/6400 is the NATO standard but not followed by everyone. Further confusion arises when you through in the artillery ranging maths (where near enough is generally good enough). So, question. What is your chart graduated based on – a 1/6283 or 1/6400 scale? Second question – given all this is there an agreed industry standard or is it personal choice? Third question – does it really matter as long as the clicks are consistent and repeatable? I say that because I shoot and test and record in a DOPE book for elevation noting that environmental issues affect bullet flight more (and I use a LRF). I’m familiar with the debate, and don’t claim to be an expert on this front but I will give you what I’ve got and I’m sure someone will quickly correct me if I’m wrong. Technically, 1/6283 is correct (from a pure math perspective). In trig, you learn 1 radian is equal to 2π. Since π = 3.1416, we know a radian is twice that (2 x 3.1416 = 6.2832). Notice the 6283 pattern? We can already see where that came from before we even finish the calculation. 1/6400 was simply a rounded version of the true 1/6283 value in order to make the math easier when dealing with that number (Sources: Angular Mil on Wikipedia, The Truth About Mildots). Question 1) What is your chart graduated based on – a 1/6283 or 1/6400 scale? The Horus CATS targets use USMC mils, which are based on 1/6283. (Source: Horus CATS Targets User Manual, The Truth About Mildots). I think Frank owns just about every scope ever created, so I’m going with his experience here. There is certainly a lot of confusion and misinformation around this topic, but it sounds like 1/6283 is far more common … and 1/6400 may not be used anywhere in the rifle scopes industry. Question 3) Does it really matter as long as the clicks are consistent and repeatable? Well that is a loaded question! The difference between using 1/6283 and 1/6400 only equates to 0.063 MOA. Does it matter? Probably not, practically speaking. Even for an OCD shooter like myself … that is just too tiny of a number to spend much time thinking about. Just my opinion though. GREAT QUESTIONS! Thanks for making me think through this. I’ve heard a little of the debate over the years, so its good to have to find some of these answers. It is the lack of any agreed industry standard that is a problem here I think. Either we do it properly with the 6283 number or we all follow the NATO standard of 6400 – but not both. Now I am just back from the range where I tested my 3 – 24 x 42mm FFP March at 100m and I cannot replicate your margin of error. I used a 200 mm start and finish point – the movement of the reticle subtended 2 MIL exactly. I did a blind test was was conscious to not look at the elevation turret as I tracked. I suspect that March uses the 6400 ratio. It would be worth checking to confirm this as different to the other scopes. Thanks for the feedback on how your’s performed. That now makes 2 people I’ve heard that said their March scope tracked well, and 3 people have said their’s matched closely to my results. It sounds like there is a lot of variance in their quality control, and you have a chance of getting a scope that tracks well or one with up to 3% error. I would say testing if your scope tracks up to 2 mils is quite different than the testing I did. That is a very small adjustment, and even Litz says you are kidding yourself if you don’t test more than that. A 2% error on 2 mils would just be 0.14″ at a 100 yards. It’s hard to see that small difference through a scope, and if you’re doing a live fire test there could be that much inherent error in your rifle, ammo, and shooting ability. Now if you test out to 20 mils, a 2% error results in 1.4″ difference at 100 yards. That is easier to measure without introducing measurement error. I actually don’t have any contacts at March Scopes, I only know a distributor. But I will try to reach out to them today, and see if I can get an answer to whether they’re based on 6283 or 6400. There is a 1.8% difference between 6283 and 6400, so that could be part of the issue here. Maybe we can get to the bottom of it. I’ll let you know what I find out. Cal, were you able to contact March about the tracking issue / discrepancy? Tried to multiple times, but they never responded. It’s unfortunate. I guess that’s the kind of service you can expect from some foreign companies. Thanks Cal for your due diligence on this. From what I’m reading the quotes from Robert Simeone and Frank from Sniper’s Hide suggest ALL of US millitary snipers use 1/6283, with exception for some fluke Leupold scopes from the 80s. “The Truth About Mil Dots” by Michael Haugen suggest that USMC snipers use 1/6283 while Army snipers use 1/6400. Am I reading these articles/opinions correctly? Which author would you say has more authority on the subject? Would you be able to reach out to them via LinkedIn or other means? Thanks again for all the work you are doing for our community. Sorry for the confusion! That is a great question. Over the past 4 months I’ve talked to multiple military snipers, as well as the Leupold engineer who worked on the scope (yeah, he’s still there and remembers the whole ordeal). There are 1/6283 mils (true mathematical value) and 1/6400 mils (NATO standard). The NATO standard is also mistakenly referred to as Army mils, but the Army does NOT currently use those. There was some confusion (I believe in the late 80’s or early 90’s) related to the US Army asking Leupold to build a scope to the 1/6400 scale, but that project was short-lived and the resulting scope was never widely used by the Army or any US military division. All branches of the US military currently use 1/6283 … PERIOD. That isn’t on my authority, but I’ve asked SEVERAL experts among experts over the past 4 months, and they all say with full confidence that is the case. Honestly, I wish I could go back in history and punch someone in the face for that mistake, because it continues to cause massive confusion! I know “The Truth About Mildots” article doesn’t make it any easier, but its the best source I’ve seen that talks about the differences in the two scales. I hope to be able to write a post on it at some point in the future, and include quotes from all the sources I’ve talked to lately about this. Maybe that will be what people start referencing, and it can put an end to the crazy debate. It was a great question, and thanks for bringing it up. I’m sure a lot of other people have been confused, so I appreciate you asking. I found one more article / official looking usage manual from Remington (Military Products Division) likely written in 2005 by Michael Haugen the author of the original “The Truth About Mil Dots” from 2001. It looks like an expanded / professionalized version of “The Truth About Mil Dots” (link below, page 3 has the details related to this controversy). From his LinkedIn profile it looks like Michael Haugen is a reputable person (26 yrs Army, 18 yrs Special Forces – mostly sniper operations, and recently Director of International Mil/LE Sales for Remington). Great user reume, though he doesn’t seem to have an engineering background. On the positive note Michael’s article / manual mentions that 1/6283 and 1/6400 are within each other’s acceptance error for the Army and we shouldn’t worry about it for practical purposes. Sweet. Thanks for the link. I may be retiring from this debate, because like you said … there isn’t much of a difference between the two. I’ve probably already spent more energy thinking about it than its worth. I know all of my scopes are 1/6283, because I’ve tested them myself. I guess that’s all that matters at the end of the day. 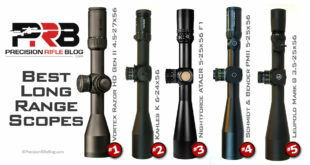 (Note: That includes an S&B PMII 5-25×56, which is in use by several branches in the military.) You can do that with your scopes too if you want. You inspired me to run a mechanical performance test on 5 of my personal rifle scopes. I’ve included my results below. My test methodology was similar to the one described herein, but I didn’t remove my scopes from my rifles – too much work to re-mount them again, as none of the scope setups I tested had quick-detach mounts. All of the scopes tested are far from new and as such have seen ample use / break-in, but have also been cared for and are in excellent condition. Testing was done by aligning the crosshairs on the center target axis on an MOA line (all these scopes are MOA-type) near the top of the target range. Perfect vertical crosshair alignment was verified as the target vertical alignment was established with a long plumb bob. I then took each scope through a series of four vertical adjustments of 10 MOA each, performed 3-5 times. After each 10 MOA adjustment I documented my findings, which can be found below. It is important to note that I am not a professional by any means at this sort of thing. 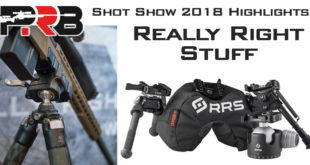 Despite my mechanical engineering degree and my zest for things such as this, I’m just an average joe that loves to shoot long range and all things associated with it – ammo crafting, tech equipment and cartridge research, building rifles, testing new loads and new gear, and in the past year even participating in some long-range shooting competitions. I’m always upgrading / refining my shooting gear and I am now in the process of really getting serious about optics and needed to do this test for my own edification / education. This scope was arguably the best scope mechanically tested, much to my surprise, as I thought my Nightforce NXS would perform the best. In truth, this scope actually had the same final “mechanical error” of 1 only one click or 1/4 MOA after 40 MOA of adjustment that the NXS did, but the NXS saw this error in the first 20 MOA while the Vortex scope took 40 MOA to reveal this small error. This scope also had 1 click or 1/4 MOA of vertical shift to the left after 40 MOA, but again, very impressive for a scope costing this “little”. This scope roughly tied for last-place with the Bushnell Elite 6500 Tactical 2.5-16. Big disappointment for me as I’ve had this scope for a while and went to the trouble to have Leupold upgrade it some time ago with better turrets. I expected better. While the image quality of this scope is quite good, that’s not what we’re talking about here, and in harmony with what Townsend Whelen said about accurate rifles, I say “only accurate scopes are interesting.” This one is not. It’s remaining life in my arsenal is short. This scope performed very well mechanically, despite the fact that a single click alignment error was recorded at just 20 MOA. This is indeed within the adjustment range of what I ask of this scope / rifle in long range shooting (just over 1000 yards) and as such need to keep this in mind as I use this scope at such ranges and beyond. However, this scope had zero reticle cant / horizontal error and had no additional adjustment error beyond 20 MOA. I’ve generally thought of this scope as a great value in optics with the features and price that are part of this package. However, this one is going back to Bushnell and will either come back perfect / nearly perfect or find its way out of my ownership. This was an ugly mechanical showing. I’ve had similar feelings regarding this scope to those described above for the Bushnell Elite 6500 Tactical 2.5-16. Aceptable glass, great zoom range, good turrets / feel, lightweight, compact, decent reticle, great price. While this scope had significant mechanical performance issues, I am optimistic that Bushnell can fix it / get me another one that performs better that I can still use on a less mission-critical weapon setup and find it perfectly acceptable. However, only time and Bushnell will tell. I may be kidding myself here, however. Certainly, for almost the same money, you can buy the Vortex scope tested herein and get something that is MUCH better in every way, including having an illuminated reticle. That’s what I will do moving forward if wanting something in this price / performance range. I should note that the adjustments noted herein for each MOA value are the TOTAL / aggregate adjustment needed to align the crosshairs with this value, and not a “delta” or incremental amount needed in adjustment from the previous MOA value. Also, it is interesting to note that ALL of these scopes returned to zero each time I adjusted them through these ranges, which was a pleasant surprise. The data does not lie. In this field of scopes, my “not top of the line” Vortex Viper PST did really really well – much better than its price would indicate. My Nightforce NXS was also excellent, as one would expect. My Leupold VX-3 was a big disappointment and did poorly as did both of my Bushnell Elite 6500 Tactical scopes. 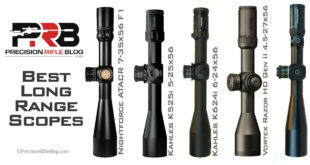 After poring over this excellent PRB tactical scopes study, I was set to move forward with either a Valdada or perhaps even an Schmidt & Bender scope as the new pinnacle of my optics arsenal. However, my own test / findings as well as the PRB “What the Pros Use” article about scopes have caused me to take a hard look at the top-end Vortex Razor HD Gen II. There just isn’t much data out there on the mechanical performance of the Vortex scope line but my tests and the real-world-use validation of many pros tells me I need to look at them closer. The warranty and features are exceptional and as such I may indeed move forward with one in confidence that it will work exceptionally well or they’ll get me one that does. Wow, Blake! Thanks for taking the time to share this with the rest of us. So many guys do stuff like this, but just keep the results to themselves … I appreciate your effort to keep detailed notes and organize it so others can benefit from it. I will give one disclaimer, and that is please don’t assume that if you have one of these scopes that it will match this exactly. You really need to test your own scope. That’s why I actually didn’t say what direction the scopes were off in my results. I just said the number of clicks they were off (not if they were down or up). I just don’t want anyone to assume that just because the scope I tested was off in a certain way, then surely their scope is the same way. Ultimately, I hope this post encourages everyone to actually check their own scope, because that’s the only way you’ll really know. There are no shortcuts. Thanks again, Blake. If anyone else has results collected in such a careful and detailed way, please follow Blake’s example and share them with the rest of us. I performed a similar test on 4 scopes a Bushnell elite tactical ERS 4.5-30×50, Steiner T5Xi 5-25×56, and 2 Nightforce NXS 5.5-22x56mm. I used a rail screwed to a solid fence post which limited my test to 18 MILs and 46 MOA on the adjustment without substantial more work and a rainstorm coming. I used a Horus MIL target and a 300′ tape to space it at one hundred yards. My results were that the Bushnell was off 1/2 click at about 8-9 mils and was off by 1 click at 18 MILs, the Steiner was off 1/2 click at 18 MILs, the interesting part was that one NXS was Perfect Through 46 MOA and the other was off 1/2 click at 20 MOA and 1 click at 40 MOA. My conclusion is that the best and worst performers were the same model. This tells me that along with your results that no matter the manufacturer you should test every scope. Hey, Kerry. Thanks for sharing your results! And I couldn’t agree more with your conclusion … no matter the manufacturer, you should test every scope.